Have you ever come across something that puts into words exactly how you feel, or what you think? Your own ideas may be slightly fuzzy, but here in front of you is the finished product. Maybe you’ve had this experience when reading a poem, or listening to someone summarize a discussion. Your thoughts – well put! I had this experience while reviewing Rebecca Rengo’s workbook Beyond Chronic Pain. 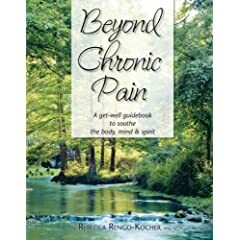 It’s an excellent guidebook for patients to learn pain management skills and an overall approach to coping with chronic pain. I really like the workbook format. It enables you to individualize the information provided in the book, and it encourages you to actively use the information. For example, in the section on enjoyable activities, there’s space for you to write what you do that’s fun, as well as new activities you’d like to try. Space to write down exactly what you’ll do and when helps you move in a positive direction, rather than just think about improving things. The workbook takes a positive tone, so it encourages and supports you. Rebecca actually works with patients, so what’s included is useful and relevant. Lastly, the author has also experienced chronic pain herself, wich gives a personal understanding to the guidebook. To purchase, you can contact Rebecca at Rebecca@rebeccarengo.com.